Catholics along with all other Christians are of the same faith, they also share many of the same common religious practices. As most other Christians follow the same version of the bible, we will be comparing the Catholic’s version of the bible with the Protestant’s version of the bible. The modern bible is not just one book, but many books, stories and historical events that have been compiled into a single volume. These books come from both the Old Testament and the New Testament alike. In the late 4th century, these books, and scriptures, were compiled into a single volume. The Protestant and the Catholic bibles are different from one another today. As the Catholic version includes seven books that the Protestant bible does not acknowledge. The between 200 B.C. and 100 B.C. the original version of the bible was transcribed from the Greek translations of the Hebrew Scripture, and was known as the Septuagint. This text was questioned by St. Jerome when he translated the original Hebrew scripture into Latin during the 380’s A.D. He believed that the Septuagint included inauthentic books, that would become known as the seven books of the Apocrypha. There are no differences between the Catholic, Orthodox and Protestant bibles when they cover the New Testament content. The New Testament is about the life of Jesus, his apostles and their lives following the crucifixion of Jesus Christ. 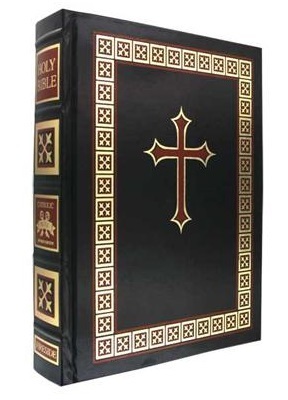 All twenty-seven books in the New Testament are included in the Catholic, Orthodox and Protestant versions of the Bible. During the 1500’s, Martin Luther broke away from the Catholic Church and embraced St. Jerome’s argument, and lead the Protestant Reformation, with the return to the original Hebrew scripture and away from the Greek translation. They only acknowledged 39 of the Old Testament books and refused to accept the seven books of Apocrypha as gospel. This division is what has led to the core differences between Catholics and Protestants. Catholics view the word of the church, as having just as much, if not more authority then the words of the bible. While Protestants only acknowledge the word of God written in the Bible as having any authority over men. The seven books of Apocrypha are also known as the books of Deuterocanonical scripture by Catholics, and have remained within their version of the bible. Meaning that the Catholic bible contains 73 books in total, as apposed to the Protestant’s 66 books. It is from these books of Deuterocanonical scripture, that Catholics derive their belief in purgatory. That praying for the dead can influence the souls of the dead, and that doing good works will please God. Protestants on the other hand, do not acknowledge the seven books of Apocrypha. Most do not accept the existence of purgatory, nor that praying for the dead has any influence on their souls what so ever. They also believe that it’s God’s grace regardless of a persons life or works, that leads to eternal life. The following table has a list of the books from the Old and New Testaments (that are found in the Catholic and Protestant bibles). I am confronted with a born again Christian, who was a Catholic for 27 years. He keeps asking what is the gospel? Can you explain? Thank you. The Gospels are the first 4 books in the New Testament. Mathew, Mark, Luke, and John. As i have read. Jusus said all christians must be born again. Simply…you give up sinful ways and turn your life over to the teachings of christ. The word gospel means “Good News,” The “gospels” referred to are the books written by Jesus’ disciples, Matthew, Mark, Luke and John. Each gospel covered the life of Jesus as the disciples walked with Jesus during His life on earth. It is important not to confuse the Gospels (books in the Bible) with “THE Gospel” which is the revelation of Jesus Christ, come down from heaven to redeem mankind and restore those who follow Jesus to the Father. When you share the Gospel, you are telling the good news of the power of Jesus Christ to redeem the souls of mankind. We do not earn salvation, it is a free gift from God! Romans 3:24, Yet God, with undeserved kindness, declares that we are righteous. He did this through Christ Jesus when he freed us from the penalty for our sins. The Good News (The Gospel) is that Jesus Christ loves, frees, and restores those who call on His name. This Good News is for all people, all races, all genders. We cannot buy it, we do not earn it, we don’t deserve it, but Christ, in His love, freely “Gives” salvation to all who call upon His Name. One mistake or misleading argument is that some think that because we are saved through the blood of Christ that we can do whatever we want and still go to heaven. This is not true. We must be born again and from there are we must give up our sinful ways and try to sin no more. Not just think that because we accept Jesus Christ that we can keep murdering and any of the 10 commandments and still go to heaven. Although people have repented with a horrible sinful life right before they for and confess their sins.. but remember.. only the Lord knows how truly sorry you are, not only sorry but repent your sins. And the Lord will make that decision. Please note that the translation was carried out in 200 year s before birth of Christ and therefore the AD should be repalced by BC. Thank you for spotting that, it was an oversight on our part and has been corrected.